Rollback was so fast that I didn't even notice it. Xbox Game Pass is the big bet by Phil Spencer that ultimately got him the seat on the senior executive leadership team at Microsoft. Phil took the reigns of Head of Xbox after Don Mattrick left Microsoft from the disastorous launch of the Xbox One. At that point, Phil had to right the ship of where Xbox was heading and started making “user-friendly” moves with removing the Kinect. Later on he had to show his value to the Windows organization led by Terry Myerson at the time and then you saw things like Xbox Play Anywhere, that allowed you to play Xbox and PC games through the Microsoft Store with one payment. While this was happening, Xbox wasn’t getting any increase in budget and was really cash strapped and the games that were being released weren’t doing so well critically and commercially outside of the Forza Horizon series. While all of this was going on and Windows was being split apart, Phil was already setting up his organization for the future under CEO Satya Nadella. He had to prove out his organization’s worth but he knew that as soon as Satya became CEO, which wasn’t that far off from when Phil became Head of Xbox. That’s when last year Xbox started Xbox Game Pass, a subscription service at $10 a month for over 100 games. Over the course of several months Phil and Satya definitely talked about gaming and see where it was going and Phil has been very adamant on focusing on the user and letting people play games whereever they are and on any device that they were on (this type of talk started with Xbox Play Anywhere). I don’t know this for sure but I can bet that Phil talked to Satya about streaming and Xbox Game Pass and how it can be the subscription and the future for their platform. He obvoiusly had to crunch the numbers for potential subscriptions and have an understanding how they will reach billions of users. That’s when xCloud came in. Cloud gaming isn’t a new “thing” in the technology space as it really started with OnLive, which eventually would be bought by Microsoft’s competitor Sony through Gaikai. There is an Giantbomb E3 interview with Phil, I believe it was last year after Game Pass launched where he talked about streaming and that they couldn’t do it until it financially made sense. A couple months ago, xCloud was introduced and it showed how Microsoft had put 4 Xbox One S stripped apart and put into blades. I believe this will be true of the first trials of the service and then they will go bigger into those blades so that it is not 1 user per “Xbox One S” inside of a blade and instead have them powerful enough to virtualize sessions. That’s when it will make financial sense and something that is scalable into the billions of users. That’s why I believe that the xCloud service will be apart of Xbox Game Pass by default. Microsoft has been following Netflix’s model all the way through and it is an understood model that everyone in the world understands, they are just bringing that model to gaming. As I stated in this forum post https://www.thurrott.com/forums/microsoft/xbox/thread/xbox-live-multiplayer-paywall-why-i-think-it-will-go-away , I believe that the multiplayer paywall will go away because of XGP (and in that same post I stated that the future of Xbox Game Pass was streaming). Microsoft wants to reach as many users as possible with a model that they understand, I pay a low price to stream content. They want to roll this out globally, and that’s how they can grab other parts of the market that don’t want to buy a console (or they don’t even sell a console in that region). I also believe that with this subscription you will also be able to stream your own games and not only the ones in the Xbox Game Pass library. Microsoft doesn’t want to stop you from playing whereever you are, but they do need you to pay to use their service, the more you play, the more likely you are to buy something like Downloadable Content or Microtransactions. Microsoft also doesn’t care what device you are running on be it a console, pc, mobile. They just want you to be a gamer into their ecosystem. $10/mo + ($499-$599): Use your Xbox “5X” console to play games with highest fidelity and Xbox Game Pass (also can stream to other devices)…i think this device will have a form of real time raytracing personally. This allows Microsoft to satisfy every type of customer out there. If you want to own a Microsoft console or you don’t want to and you just want to try out their games. Getting that subscription money from users that wasn’t even a customer of Xbox before can now become one with the lowest barrier to entry, $10. Their total addressable market is in the billions of users. There’s a huge mobile gaming market in Asia that is one of Microsoft big targets. Microsoft has actually started a gaming asian group for lack of a better term that will outreach to developers out there to get on the Microsoft platform. Microsoft talked at the Samsung developer conference talking about xCloud and how they can reach so many more users through game streaming. Mixer is there as an easy to get to more users to use their service. Imagine watching someone play a game on Mixer and they want to invite you as you were talking to them in a chat, you can immediately play if you have Game Pass…but that’s also a potential place to sell game pass as well. You see a game on Mixer and you are interested in playing it, there’s a button that says “buy game pass and play this game instantly”. That’s what xCloud can do. That’s why Google is also in this business. Streaming also allows Microsoft to compete with Apps Stores as well. You can buy a little game on the app/play store or you can use this subscription to play console like games. It’s also a way for gamers to get into the Microsoft ecosystem. This streaming service can also be applied to Windows Mixed Reality and other VR/AR headsets. Phil does want it on every device. Microsoft is increasing their studio output not only for having better exclusives, but to reach different niches in the market. They are no longer just focusing on the “big” mainstream games, they are trying to do what Netflix and Spotify do, get every type of content that people like, not just the popular ones and satisfy those users. If you satisfy enough niches, you get the entire market. That’s why you will continue to see more studio acquisitions and that’s why [email protected] is very important to them. A lot of those games are becoming games that launch on Xbox Game Pass. It’s all about increasing the value of Xbox Game Pass and getting people on it. This gameplan that Microsoft has is to not win the “console war”…it’s about getting gamers wherever they are in the world and monetizing them. Unlike Netflix and Spotify, gaming has a better model in which they can get more money from a user from a single game. Monetizing from DLC/MTX and letting users outright buy songs while also subscribing is more lucrative than only having a subscription. 100m subs = 1 billion in revenue in one month alone…but as I stated, that’s just on subs, games can monetize even more. With the addressable market in the billions, you can see the potential to make a ridiculous amount of money. The lowest barrier to entry will get the most users. That’s why Satya believes in this endeavour and that’s why Phil got on the executive leadership team because of the potential money. In reply to Dan1986ist:Yes, it works as expected. A couple years later than I would have thought...now will the US do the same? I am ready for the future. I think there's a great missing piece...PRIVACY! Windows 10, Version 1803. orWindows 10, April 2018 update. In reply to djross95:Uhm...what do you want more out of a desktop OS? In reply to paul-thurrott:Math is a hard computer science problem. Mixer stuff is the most interesting part of all of this. In reply to Chris_Kez:It doesn't have to be an expensive device. In reply to maethorechannen:Yes, there is an overlap of people who own PCs, play consoles, and play on Switch. This is not even surprising (the detachable part) as this is EXACTLY what they showed on the Futures video. Now, I know what you may be thinking. “Microsoft is entering the handheld business?” This is not that. Microsoft is not making a dedicated handheld device. What Microsoft is doing is making a Switch competitor as a byproduct of its own endeavors with the Windows platform. I should say potentially because it does depend on if Microsoft and Windows are successful with their future plans. So what are the dots and how do we connect them? The dots are Windows OS, Continuum, Universal Windows Platform, Minecraft and the fabled Andromeda device. Microsoft is building their future of Windows with Windows Core OS, basically a more modernized version of windows that is flexible to the device that it is running. If a device is a 2 in 1, it would have a tablet mode, if that device’s screen was put into the keyboard, it would have a desktop mode. This should sound familiar because that is basically what Continuum is. The difference is that Microsoft is rumored to be building this for all device types and input types. You can have that same 2 in 1 be a tablet, or desktop, or potentially show an Xbox like UI when an Xbox controller is connected. You have this OS, and you have this feature Continuum (which Satya Nadella has been on record with Mary Jo Foley of being a true differentiator of their devices, at the time phones), you need a development platform for these games to be built on. That’s where the Universal Windows Platform comes into play (and to a smaller degree PWAs but we need more information on that). UWP is a way to make “Continuum Enabled Apps”. Make games that can adapt to the mode in which the device is running. This too should sound familiar as it is basically what the Switch platform does between its two modes (docked and portable). Developers are already used to developing multiple profiles for a console and PC, and they could do the same thing here. You can’t make a device without games, and what better game to sell a device more than Minecraft. Minecraft is already on every platform you can think of (that has some type of marketshare) and the team at Mojang can lead Microsoft Studios and other developers on what you can do with UWP on the newer Windows OS. This version of the game would be the same version that runs on Xbox, and PC (Microsoft Store), and potentially, the rumored project Andromeda device. The project Andromeda device is a dual screened PC that, according to the rumors, will act as a tablet, a phone, and a PC via Continuum. This would be the category defined by the device that would be Switch like. How is this compared to Switch? Well, with Andromeda and Continuum, you have the ability to be a portable or a docked device. There’s only one caveat, input. With the Switch, you use the same controller (joycons) for the console in either docked or portable mode, whereas this device, we don’t know what input it would take. Will it be touch controls while on the go or will you have to connect an Xbox controller to it. The Xbox controller input for when your device is docked makes sense, but does it make sense when you are on the go? In my opinion, I believe that the best course of action would be to let the user decide which input that they want to use, touch or controller. So how is this a competitor to Switch? Well, it is and it isn’t. This is just a byproduct of the rumored Andromeda device. But this is more than just the Andromeda device, it’s the Windows platform. Every portable device that is made with this future Windows OS will have that potential. The reason why I say potential is because Windows isn’t known to be a factor in the mobile market, they have to be successful there in order for Nintendo to even flinch. Andromeda doesn’t need to be the next Nintendo Switch, or iPhone, it just needs to influence people to buy mobile Windows devices made by Microsoft or their OEMs. If successful, Microsoft can gain game developers to not only make their games for Xbox, but also PC, and scale across their devices. But that’s a huge if. That’s one of the “ifs” that Microsoft is betting on. It’s also one of the reasons why I believe Microsoft is betting big on gaming. It will take a lot for Microsoft to pull this off, but if they do plan on releasing some games in a “switch” type of mode, you will have Microsoft going against Switch with the Andromeda device category, Steam/PC Gaming with the Microsoft Store, and Sony with the Xbox console. Seeing as Microsoft is not winning nor in a close second in any of those categories, they have a lot of work ahead of them and some luck. Microsoft has two subscription services under Xbox Live, Xbox Live Gold and Xbox Game Pass. On Xbox consoles, in order to play a video game online, you must have a subscription called Xbox Live Gold which nets a consumer that online play ability and what Microsoft calls Games with Gold and Deals with Gold. GWG gives a user two Xbox One games and two Xbox 360 per month, the xbox 360 games you keep forever while the Xbox One games still need your subscription in order to play. DWG gives discounts on various games or downloadable content. The cost of Xbox Live Gold is $5/mo or $60/yr. Xbox Game Pass is a subscription service that gives an Xbox One user access to play over 100 Xbox One games or Xbox Play Anywhere titles for $10/mo or $120/yr. Microsoft started the console policy of users paying for online privileges. Sony has adopted that policy, and now Nintendo has joined with their service coming late 2018. Microsoft tried to enforce this policy with the ill fated Games for Windows Live on PC. The PC gamer market refused this policy and Microsoft ultimately dropped GFWL. Microsoft has re-entered the PC gaming market but the games on PC don’t need to have Xbox Live Gold in order to play online. What Microsoft wanted was the same thing that they had on console, to put on PC. They want subscribers. Subscriptions tend to be a highly profitable market for businesses and as anyone following Microsoft can see that their model for selling software has been subscriptions over the past couple of years, but for a very long time with businesses. Office was like gaming once, only distributed by a single payment, and now Microsoft is pushing for it to be a subscription for everyone to use. Microsoft wants the same thing with gamers. Xbox Live Gold is their way to get subscribers. There’s only one issue with that, it has peaked. Microsoft’s Xbox One console is in second place (while profitable) but small comparative to its biggest competitor Sony’s Playstation 4. It has been recently been revealed that there are around 35 million consoles on the platform. We don’t know the exact number but a large portion of those users are Xbox Live Gold subscribers. It’s obvious that Microsoft can’t get 100% of those users to subscribe to their service as different gamers have different wants and needs. They can only maximize their profits to a certain percentage of their users. Then we have Xbox Play Anywhere and the Microsoft Store on PC where users can play certain games on that platform. Microsoft isn’t putting Xbox Live Gold on that platform as those users refused to pay that “online tax.” Then we have mobile where there is a small portion of games that use the Xbox Live API but those games aren’t using Xbox Live Gold either. So how does Microsoft get this large number of users to get on a subscription? My answer to that is Xbox Game Pass and its future. Currently XGP is only for the Xbox One console (even though when it first was announced it had PC but has to be taken down) though you can play Xbox Play Anywhere games on PC that lie on the service. So if you were a PC user and there were games that were XPA and on XGP, you could subscribe. Microsoft recently announced that all of their first party games will be put on Xbox Game Pass going forward and that includes Sea of Thieves, State of Decay II, Crackdown 3, and all future Halos, Gears, Forzas. Basically, think of XGP as the Netflix of games where the first party titles are like “Netflix Originals.” The future of Xbox Game Pass will eventually be game streaming. Phil Spencer has been on record stating that we could see the technology for it within the next 3 years. Playstation Now already does this, albeit poorly. What does this have to do with Xbox Live Gold and its multiplayer paywall? Well, I believe that Game Pass is the reason why that paywall goes away. The future of Xbox will lie in two things, Xbox Game Pass subscriptions and downloadable content/microtransactions from games on the Xbox platform. What XGP gives is the ability to lower the barrier of entry to purchase high margin DLC/MTX. In order for that to be highly profitable, the service will need a large number of users. In order to have a large number of users, you need to lower the barrier for users to play said game. That’s where Xbox Live Gold multiplayer paywall comes in. Xbox Live Gold blocks off a section of games that can be played by a larger number of players who don’t subscribe to it. If your business is only selling to a subset of users, you can’t maximize your profits. What Microsoft can do is get rid of Xbox Live Gold multiplayer paywall, still keep the service for the four free games, and deals with gold and start pushing for Game Pass. This is a more enticing value to a gamer that normally doesn’t play online nor paid for Xbox Live Gold. What they have proven is that they don’t need to play online and they aren’t willing to pay for it. But now there’s a service that offers hundreds of games, free online, you’ll be more open to playing online than you weren’t. From a business standpoint, if you can turn every user who was a Xbox Live Gold subscriber to a Xbox Game Pass subscriber, you have just doubled your earnings per year as XGP is double the price. But because you drop the multiplayer being apart of another subscription, you can potentially add more users who weren’t on XBLG. Also, for Microsoft, every transaction for a 3rd party game selling DLC/MTX, you get a piece of. So increasing the amount of users, increases the chance of 3rd parties selling DLC (and 1st party), and increases the amount of profit the business was having. Let’s also look at the fact that people don’t like having multiple subscriptions within one “thing” It’s a turn off for a lot of folks. How can you tell a mother, you have to buy this console and then a xbox live subscription to play online, and then xbox game pass so he/she can play games? The parent wouldn’t be please. But if you say that you just have to buy a console for X dollars and pay $10/mo for 100s of games and new games that come out, that seems like (and is) a bargain. I also can’t stress enough that having 1 simple subscription is better for marketing purposes. Microsoft will soon be marketing their games like Netflix markets their movies but for Game Pass. This also helps with the streaming and PC future that Microsoft has. Microsoft is working on Backwards Compatibility of OG Xbox and Xbox 360 games for PC. Phil Spencer has asked his team for it. I believe it will eventually happen. Once that happens, and more and more Xbox Play Anywhere titles on Game Pass occur, then the PC market is open for Microsoft (once they fix their Microsoft Store issues). This also goes for their streaming future where the console or PC isn’t the entryway to playing games. It’s if you have a screen (mobile or not) and a controller you can play. This also goes hand in hand with what Brad Sams was talking about with Microsoft coming out with a streaming stick. But that discussion is for another time. I believe that Microsoft will officially get rid of the multiplayer paywall at the beginning of the next generation of consoles. It is a easy way to make a clear message about it going away and maximizing profits on users of the current generation while Microsoft fixes their PC issues and the game streaming tech becomes available. Thought they can do it early, but next gen seems right. Having all of your 1st party games available + 100s of 3rd party games on day one of buying a console for $499 and just add $10…it seems like a very enticing proposition. That’s what Microsoft is setting up for. The digital future and the subscription future (which sounds a lot like Office 365…I do think that they’ll have tiers to Game Pass like Office for the amount of users on the subscription). I'm ready to give them my money. My original is still good but having another and newer one will be good. In reply to Tourniquet:I believe the Andromeda device is just a new way to view a PC...that is mobile. LOL. In reply to glenn8878:They also had no credibility selling tablets/laptops/desktops and here we are. Would be interesting if they make a PWA out of the portal...and put it in the store. Also the same app on Xbox One. I was thinking the same exact thing yesterday. Already found two bugs and sent feedback. Alpha ring foreva! In reply to Brad Sams:Denied. I like the update. It's definitely faster. It's some getting used to but nothing that is not welcomed. I think that it would be good to have a thread dedicated to what we think what the Surface "Phone/Mobile" could be. Let's guess (since why not)! I've been thinking about this for a while and I have tweeted this thought of mine to Paul, Brad, and Mary Jo a long time ago. Like the Surface Studio, Dial, and HoloLens, I think Microsoft has shown us the Surface "Mobile/Phone" in their "Future" videos. 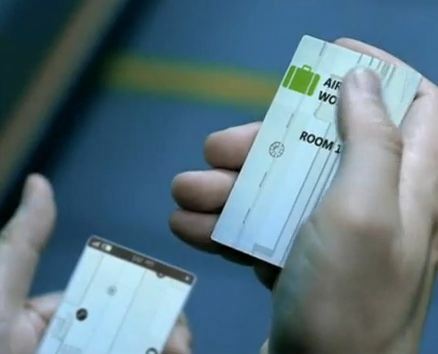 In Microsoft's Concept: Future 2020, you can see at 2:05 a man holding a phone (albeit smaller than what I think it would be) with two screens connected together. That phone can also disconnect the other screen and still operate. 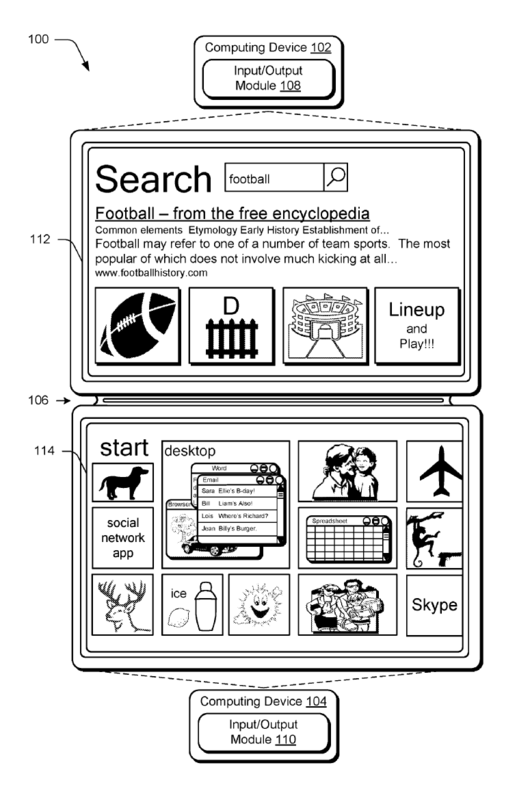 Microsoft also has a patent that is very similar to this, it's about connecting two surfaces together. There are other pictures describing what we see in the video. Obviously Microsoft makes a bunch of patents for stuff. I just found this peculiar. The main reason for this is Continuum. It would be possible to have this effect through wireless Continuum, and "wired" Continuum. Having 2 screens in one device. The other screen could act as a cover but also continue the experience of using a phone. Yes, this is similar to courier. I bring that up because I do think that just like all other surface products, Surface Mobile will use pen, hence all the updates to Windows Ink. The Surface Mobile becomes your little notebook to take notes in, a phone cover (just like Type Cover), can have one hand taking a phone call while still interacting with the phone because of the second detachable screen, and best of all can become a full PC. Continuum allows the "second screen" experience that no other phone OS can do. I believe that this is what Satya was talking about Continuum being that differentiator. Just becoming another Windows 10 Mobile phone that can be a decent PC isn't enough, differentiation is what the Surface brand is about. This is what I think what Surface Mobile will be. What do you think about what I said and what are your predictions of what Surface Mobile will be?